Lately, I’m all about easy dinners and sheet pan dinners are the perfect way to go. Less dishes = less mess = happy me! Everything cooks on one pan so clean up is a breeze. They are usually pretty quick to make, too. I’ve rounded up some of the best sheet pan dinners to make tonight. Add these recipes to your weekly meal plans and get cooking. The hard decision is which ones to try first! Which sheet pan dinner will you make first for your family? I love the Sheet pan dinners! I want to make some of these and have for dinner. I like having all my dinner in one pan. Easy clean up! Great dinner ideas, love it. 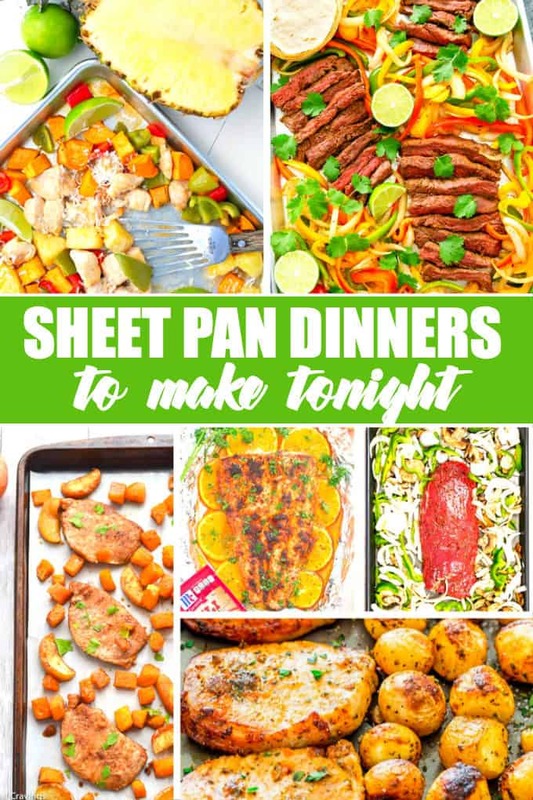 So many good ones – the one that really caught my eye is the Sheet Pan Supper: Hawaiian Chicken !!! Oh, I want to make it asap! Thanks for all the great dinner ideas,now to choose one ! These all sound so delicious especially the steak fajitas! Oh my, what fantastic looking sheet pan dinners, wonderful. So many delicious ones that I’d love to try. Seems such a waste to put on the big oven just for me though, still what has to be has to be right? Pinned for later, thanks so much for sharing, these will save some time. Well the one I’d try first is the Sheet Pan Orange Chili Salmon. Love salmon. The Sheet pan with Garlic Chicken and Veggies is the first that I will try! Nice ideas, never tried making sheet pan dinners.